On June 11, this writer asserted the present synodic month (the time for one cycle of the moon through all its phases) might not have set itself until a few years before the Biblical Famine. Professional calendar watchers will, to paraphrase Actor George C. Scott in Dr. Strangelove, etc. (1964), “go absolutely ape and strike back with everything they’ve got.” Let us, then, look with judgment on what the calendar watchers really have. The historical evidence in fact agrees with human beings first keeping a 360-day calendar, realizing early the solar year had five more days plus a few hours, and only centuries or millennia later trying to divide the year by the phases of the moon. Most of the history of calendars comes to us from after the Biblical Flood. But one pre-Flood source survives: the Annals of Shem, Ham and Japheth. Moses, of course, included that in his first Book of the Law (Torah). We know these Annals as Genesis 6:9(b)-10:1. The three sons of Noah described the design of Noah’s Ark (Tevah, a name meaning “life ship”), the breakout of the “fountains of the great deep,” and the “cruise” of Noah’s Ark before it grounded and Noah, his family, and their animal and bird specimens disembarked. Notice: water “prevails on the earth” for 150 days. That interval fits to the day between the seventeenth day of the second month, and the seventeenth day of the seventh months. So thirty days make a month. Notice also: in the twenty-fifth day of the eleventh month, a dove flies out from the Ark. She never comes back. Then after the turn of the year, Noah and his sons find their Ark on dry land. fifty-seven days later, they see dry land all around them. Why shouldn’t we assume that thirty-five days passed from the day a dove flew away and never came back, to the day the great barge rests on dry land? So this passage clearly supports a calendar of 360 days, in twelve months of thirty days each. Months began and ended with the new moon. 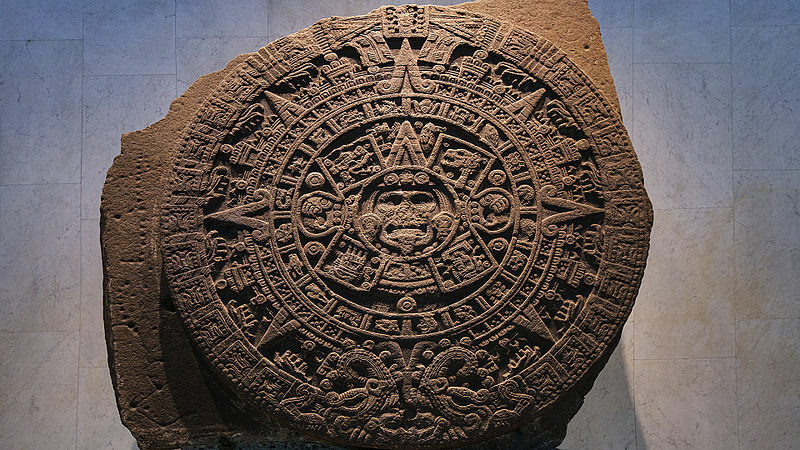 Aztec calendar stone, National Museum of Archaeology, Mexico City. Photo: Sasha Isachenko on Wikimedia Commons, CC BY-SA 3.0 Unported License. Secular calendars of the ancient Near East concern us here. They include the ancient Sumerian and Egyptian calendars. Egypt swiftly adopted a solar calendar of about 365 days. The regular flooding of the Nile River would have given them that clue. In fact, as this Wikipedia entry shows, the Egyptian year began and ended with the Inundations. The Egyptians also watched the stars early in their history. How soon the Egyptians (who descended from Ham) realized a year had more than 360 days, scholars do not quite agree. But on one thing they do agree. The Egyptians divided their year into twelve months. Shem, Ham, and Japheth, of course, did the same before the Flood. Lunisolar calendars began with the Hebrews and the Babylonians. The ancient Romans used a 354-day calendar and relied on their Pontifex Maximus to throw in an extra month before their month Martius (modern March). But not all Pontifices Maximi did this. Some played politics with the calendar. Others (like Quintus Caecilius Metellus Pius) simply neglected this duty. Julius Caesar then became Pontifex Maximus and reformed the calendar to what we use today, except for Pope Gregory IX’s formula for determining when a leap year is not a leap year. Thus scholars of ancient times have no record on which they may rely, to tell them the length of the month before about 599 BC. Then the court astronomers of Nabopolassar (or Nebuchadnezzar II) invented their 19-year cycle. Note: Hillel II, in writing a calendar for Diaspora Jews, also used a 19-year cycle. From this we know only that by 599 BC, careful observers knew how long a synodic month ran. (They probably knew this earlier in ancient Rome.) These scholars have no reason to suppose that ancient human beings knew, or even cared, how long a synodic month ran. In sharp contrast, Moses recorded precisely the months, and days of the months, for observing the various festivals and for recording key events. So, though the Israelites kept their calendar by observation, they still knew how long a month ran, and would not expect that to change. Very likely, in the days of Abraham, Isaac, Jacob, and Joseph, the month did change. All this agrees with the Moon losing six percent of its orbital energy between the Biblical Flood and the Exodus. And as noted before, the moon likely lost the last great part of its energy to an asteroid that passed too close to the moon (or the earth), calved, and bombarded the moon with its fragments. Or most of its fragments. For at least one likely fell to earth instead. The dust cloud from that fall disrupted the weather over the mountains where the White Nile and Blue Nile have their sources. With the result that the Nile failed to inundate to useful levels for seven years. This should solve the mysteries of the calendar. We might never know how many times the length of a month changed. Abraham, Isaac, Jacob, and the sons of Israel simply did not care about a thing like that. Moses, with his Egyptian court education, did. But by then the last of the great changes in the synodic month had taken place. So Moses and his followers kept a more regular calendar after leaving Egypt. RETURN TO FULL LIST OF ARK AND FLOOD DEFENSES.